Last year, Michelle, my daughter and her hubby Jordan bought a new build home in an up and coming subdivision south of Ottawa. The keys to this adorable starter home are being handed over today. Last week I went with M & J and Jordan's Mom for the final inspection. There are now shutters on the lower windows, and the front door and shutters are painted in Wenge. 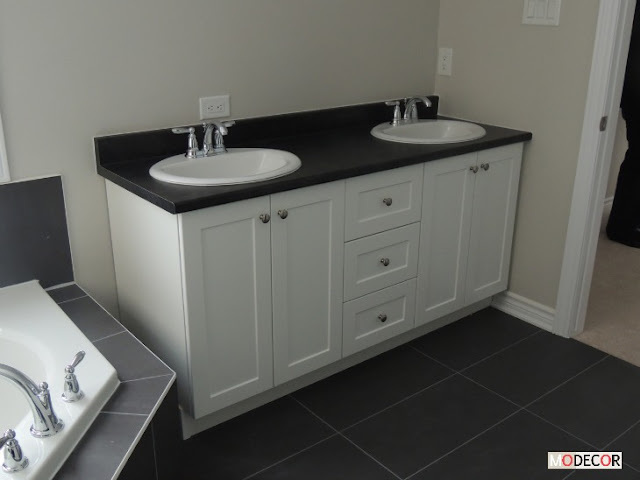 When a house is being built in a builder subdivision, often there are very few standard choices when it comes to finishes. There may be 3 options to chose from or the much more expensive "UPGRADE" option. Michelle and Jordan invited me to help select their finishes about a year ago...and I must say, there were slim pickin's when it came to the standard finishes. My advice for them was to do builder upgrades on permanent finishes and only those they simply could not live with, and to chose the best standard finishes that worked with the undertones of the permanent finishes. 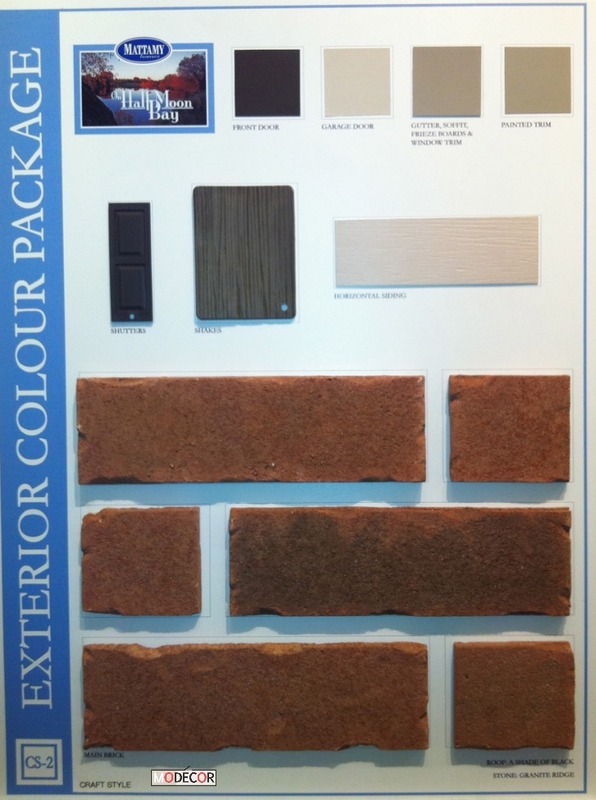 This is the builder sample board of the exterior finishes Michelle and Jordan chose. There were three exterior sample boards to chose from with no upgrades available. 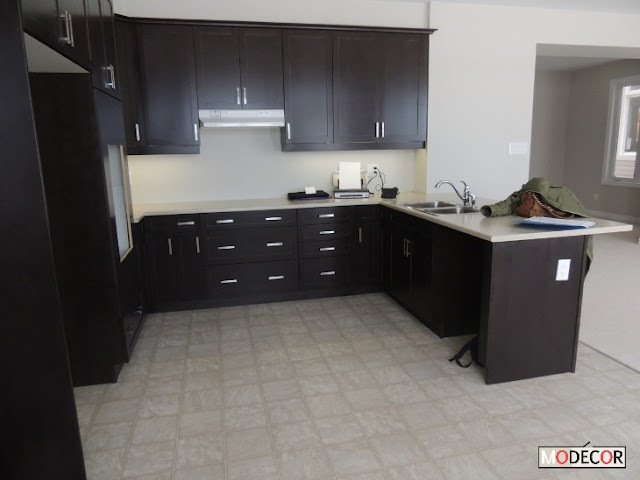 This was a super tough decision to make because they preferred the roof colour from another sample board but did not like the trim finish, and hated the trim and vinyl colour from the third sample board. A compromise had to be made and these finishes and colours won. The main floor is open concept, highlighted by a large kitchen and breakfast nook. There is a lot of real estate in the kitchen and therefore much thought and discussion about the colour of the cabinets ensued. Michelle wanted a white kitchen. I adore white kitchens, but their kitchen will be visible from all angles and corners of the living and dining rooms and the furniture in those rooms will be dark to dark/med toned. To unify all the connecting spaces, we went with a Wenge finish on the shaker style kitchen cabinets. The appliances, which are stainless steel, have not been installed yet and the white hood fan (standard) will be changed to stainless steel. You can see in this photo the standard choice for laminate flooring and carpet. 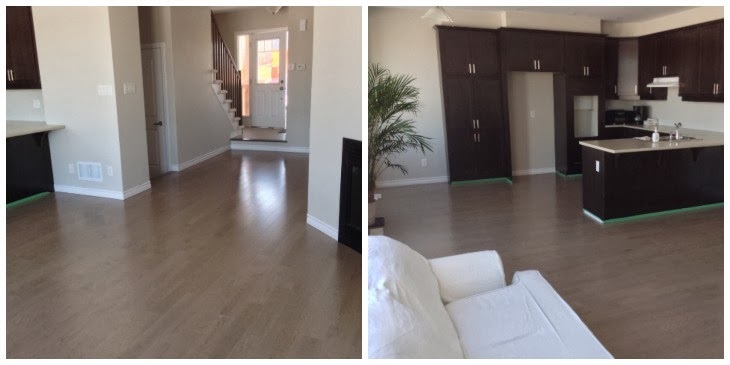 An upgrade from standard vinyl to hardwood was not an option, cost wise, for M & J. However, Jordan who is quite a handy guy, and some friends and family are ripping all of the main floor flooring out this week and installing 4" wide planks in a med 'greige'. If they could, they would not have had any flooring installed by the builder on the main floor at all, but the final inspection cannot be signed off without flooring being installed. Waste of time, money, resources and although this laminate and carpet will be going downstairs to the unfinished basement, you can bet that other folks in this situation send theirs to landfill. Once the kitchen cabinet colour was decided, the railing and spindles and newel post became a source of discussion. The standard railing etc were decidedly dated...they were turned oak...very 1980s and did not resemble the other architectural features of the exterior of the house which leans toward 'Craftsman' style. I insisted the railing package be an upgrade, as doing this later would affect the carpet on the stairs etc. Upgrading the carpet on the stairs to match the knew hardwood is not in the cards for M & J...perhaps the next house....and now that Baby Bean will be climbing these stairs in a year, carpeted stairs are perhaps the better option. 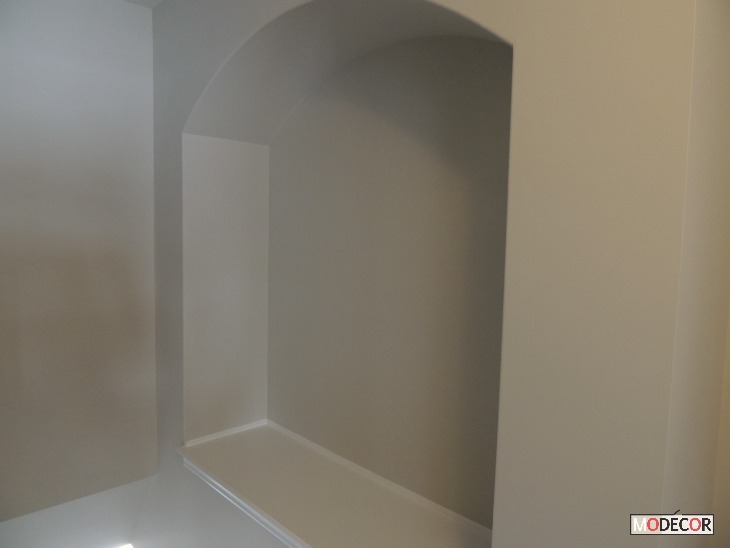 This curved niche along the wall going up the stairs is an interesting feature...I guess. We asked the builder if it could be removed and the extra footage brought into the room adjacent to it, but that was not possible for some reason. I'm wishing a recessed light had been installed at the top of the curve. Perhaps Jordan can wire that in at a later date. I'm thinking a large, colourful piece of artwork will take up residence in this niche. The same curved feature is echoed just outside the master bedroom door...a nice touch. 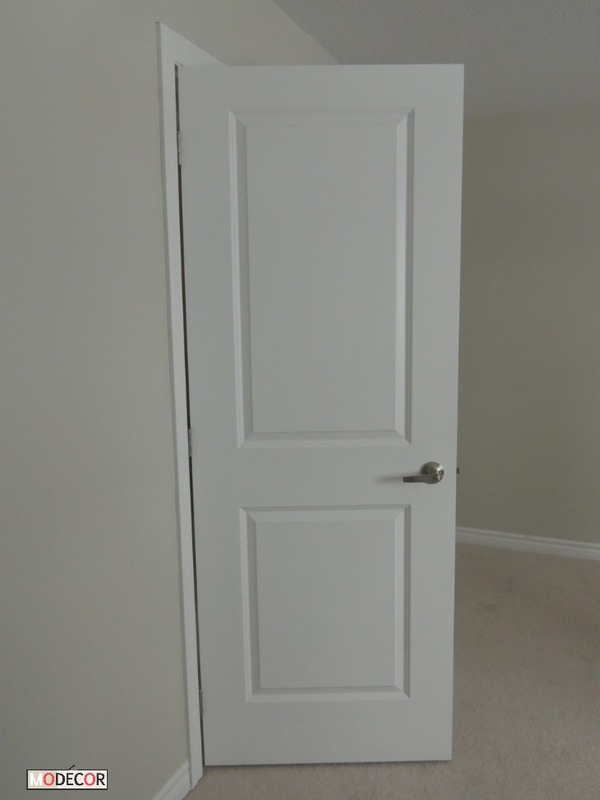 Speaking of doors, the standard interior doors sporting a curved top panel, and the heavily grained wood showing through the paint did not reflect the style of the house. I suggested another upgrade was needed, as the time, money, expense of priming, painting and installing all new doors at a later date did not make sense. Michelle and Jordan wanted a contemporary feel in the master bath and therefore chose to upgrade to large rectangle slate coloured, porcelain tiles for their floor, tub surround and shower stall. The countertop is standard laminate and may be switched for quartz later, but is not a priority. 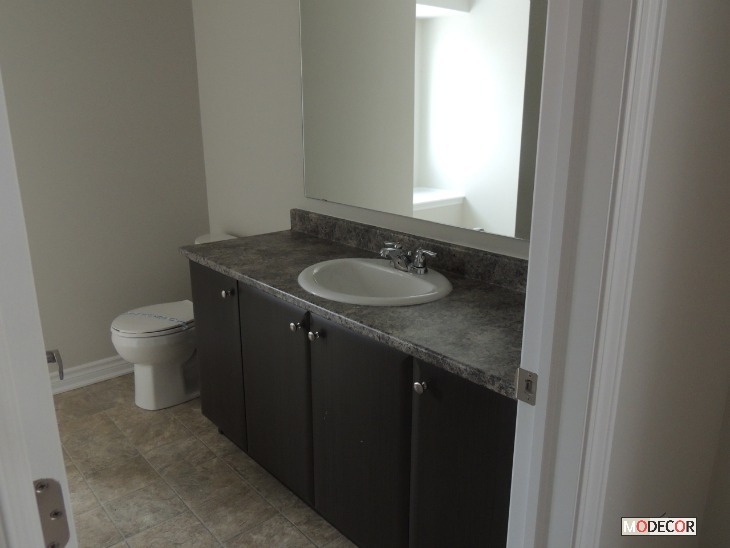 They are choosing their own mirror(s) and light fixture for this bathroom. In fact, most if not all of the builder light fixtures will eventually be changed to suit M & J's aesthetic. In the main bath, the counter top is laminate and may eventually be upgraded to quartz, but the laminate floor simply has to go. There were three colour choices (they all looked the same to me) and only one pattern for the standard flooring. Ending up with the standard laminate flooring was a sore point for Michelle, it is so ugly...but Jordan has promised that changing it to a more suitable laminate will be a priority. And, now that promise is in writing in this post. 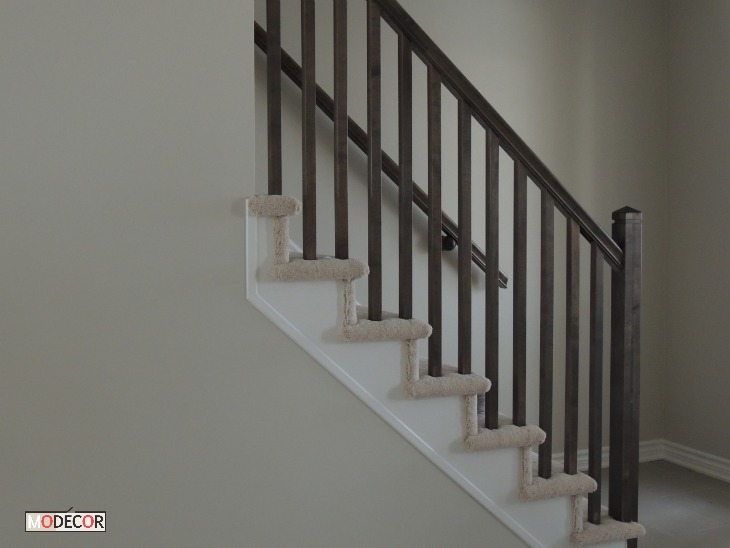 The neutral wall colour throughout is of course chosen from the builder selection offered. I always choose colours for clients after I have seen their existing artwork, carpets, and fabric choices. However, if you are working with bare bones as we were, ie: no existing furniture, fabric, window treatments, carpets, artwork etc. it is wise to choose wall colour(s) that work with the existing undertones of the flooring and kitchen cabinets. If necessary, new wall colours may be chosen once your home is 'dressed'. If you are not building a custom home, and upgrade dollars are a consideration, you have to choose your finishes carefully in the confines of what is being offered. Spend your dollars wisely on the permanent items...decide what can be upgraded now and what you can upgrade later yourself. As promised, Jordan installed new hardwood floors throughout the lower level shortly before they moved in. This required removing all the carpet and vinyl flooring the builder installed. This is a huge improvement on the standard choices offered and a less expensive choice for Michelle and Jordan over opting for the hardwood upgrade. If you enjoy reading this blog...please hop over to my group blog http://thetbbs.com/ where there is SIX times the enjoyment. 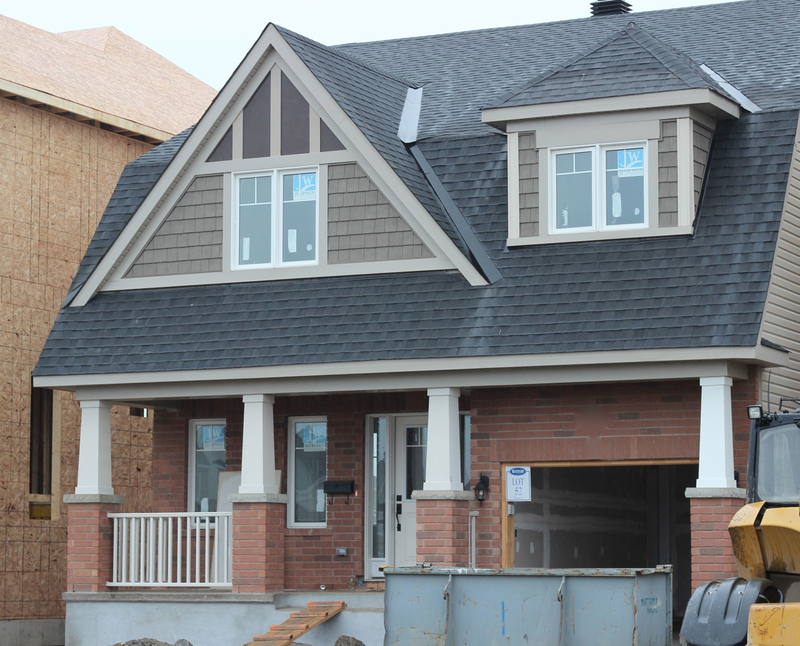 Helping homeowners in Ottawa downsize from a larger home and design their new smaller home.